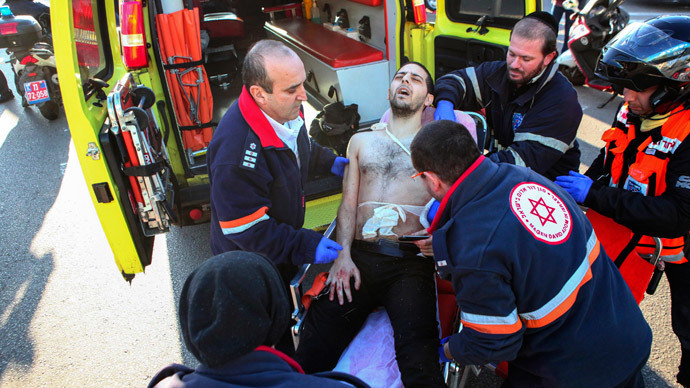 A stabbing attack by a Palestinian on a Tel Aviv bus on Wednesday, which left at least nine people injured, has fueled the flames of Israeli-Palestinian conflict, with a war of words reported by local media. The leader of Bayit Yehudi, a religious political party, Naftali Bennett put the blame for the attack squarely on Palestinian Authority President Mahmoud Abbas, the Jerusalem Post reported on Wednesday. Israeli Prime Minister Benjamin Netanyahu blamed the Palestinian Authority for the attack, saying it was a "direct result of the Palestinian Authority's venomous incitement against the Jews and their state. The same terror tries to hurt us in Paris, Brussels and everywhere," he said, as cited by Haaretz. Hamas, on the contrary, regarded the attack, as a “natural response to Israeli terrorism,” according to the Islamic organization’s spokesperson Sami Abu Zuhri, as cited by the Jerusalem Post. Izzat al-Risheq, a senior Hamas official, called the attack “… a brave and heroic act.” According to the official Hamas statement, it was a reaction to the continuing “Israeli crimes” against the Palestinian people. Hamza Muhammad Hasan Matrouk, the attacker, said he was motivated by Israel’s Protective Edge operation, the religious tension at Jerusalem’s Temple Mount, and extremist Islamist television programs, according to the Jerusalem Post. The attack on Wednesday during the morning rush hour, when a young Palestinian stabbed a bus driver and several commuters, was the first attack in Tel Aviv since the middle of November. In that incident, an Israeli soldier was stabbed to death by a Palestinian.